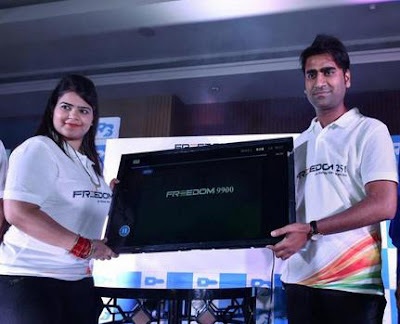 Noida based company Ringing bells is popular his products of Freedom 251 launched in past with cheapest products ever in mobile world. Now company one more announce on Friday to provide HD LED TV Just at Rs. 9900 only. You can this product open booking on Independence Day (15-Aug). Ringing bells already successfully deliver his cheapest mobile number of people who have booked it. This successful story after company to lunch LED TV in low budget. Now people one more product available in very cheap cost. This LED HD deliver on 16 Aug to start and this product available cash delivery only. Company also announced, this product booking only one day done for his official websites. You can book your product to be shipped to COD (Cash on Delivery) but company not entirely describe about How many Units to be shipping on plan. Company says are hoping good response for HD LED television 31.5 inch screen size with resolutions of 1366x768 pixels and Good Contrast radio in those figure 3000:1. Let’s talk about port: 2 HDMI ports, Two USB ports and 2 speakers of 3 Watt. Now everyone in his mind How to possible booked people to deliver on time? 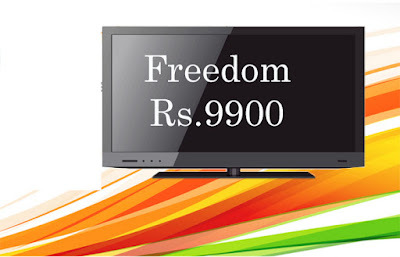 In compare of findyogi.com, in 10000 price no any kind of television display but some chines manufacturing company like “Vu” has sold below 10000 price in ecommerce sites like Amazon.in, Flipcart.com, and snapdeal.com same specification of Freedom 9900. Ringing Bells Pvt. Ltd. has a dedicated community of smartphone lovers who associate consistent to share his innovative idea and customer centric inputs and produce high quality products, along with testing at a few phrase to distribute the ultimate client experience in its cheaper products. According to Ringing Bells' founder and CEO Mohit Goel announced 1 lakh product are ready to be shipped in future. You can also check for more detail on officially website www.ringingbells.co.in.